I noticed an issue when using the halftone filter and this is regardless of the settings used (in my case I want maximum contrast), when applying a halftone filter to a layer that has been threshold at 99% (thus creating essentially 1-bit raster ie: Black and White pixels) and rasterized (or nesting the layer within a group and applying the halftone to the group), the halftone filter creates what is essentially a blurred halftoned edge. In Photoshop when we are trying to "RIP" halftones at high resolutions for output to film transparencies, we need to halftone our separated plates, usually a greyscale image. During this process we will have "objects" or portions of the image that are solid black and white pixels, no grey edges, to be halftoned like for instance a piece of solid text in which we do not want a "fuzzy" edge. 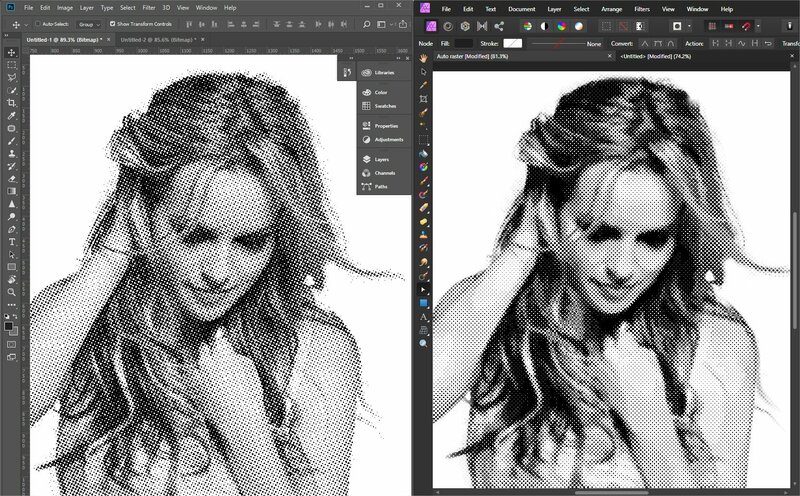 During that process in Photoshop it's bitmap halftone feature will not "add" a blur to the edges of pure black and white areas of the image whereas Affinity's filter does. I would love for the ability to RIP in Affinity and this cannot be done successfully without this issue being "corrected". 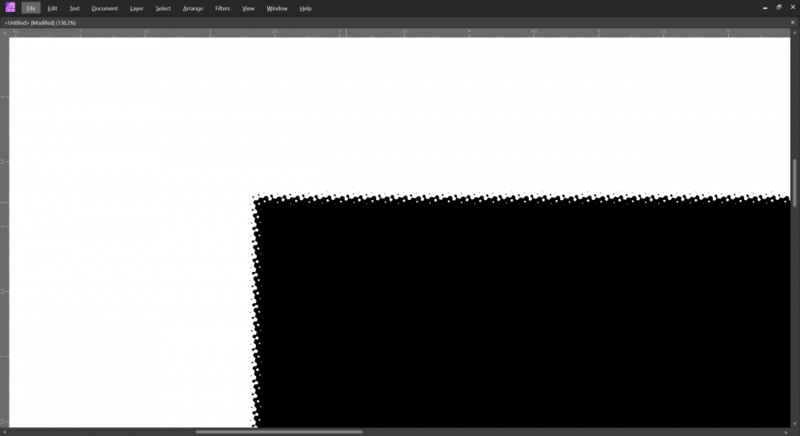 Take notice that the edges of the rectangle will now have a halftone applied to them. 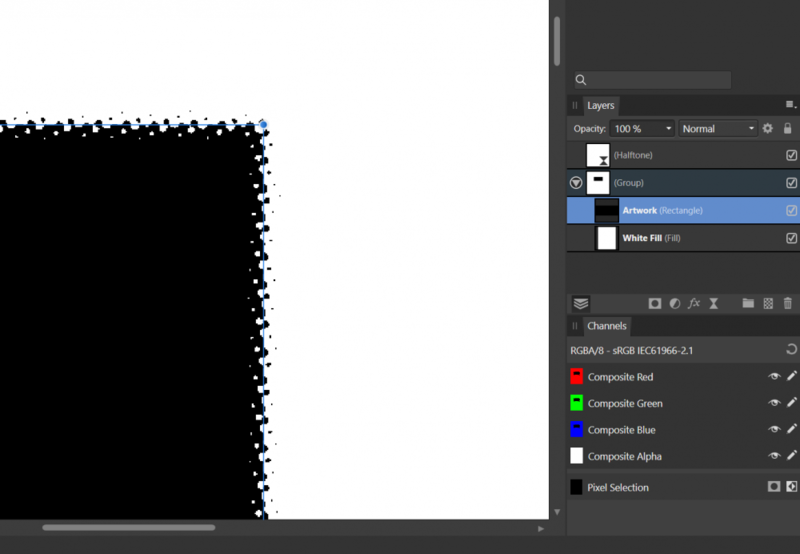 This does not happen in Photoshop's bitmap halftone. How could we remedy this "issue" or add to the feature set in Affinity for those of us in the screen printing community that desperately would like an Adobe alternative. Attached are two images, the rasterized then threshold'd image that is basically a 1-bit image ( obviously to post on the board it is saved and compress so the edge is fuzzy), and the resulting fuzzy edge halftoned version of the same image. If I do what you said but without grouping, this doesn't happen—why is grouping important? I used a Round Dot Type instead of a Cosine one—does that matter? PS uses a round one... If I don't group, the dots appear inside the shape. The process in PS feels completely different to the steps you told me to do in Affinity Photo so is it fair to expect different results? What happens if you just use a regular image with a Halftone Filter and a Threshold Adjustment? I'm getting pretty similar results in PS and Photo if I use a Round Dot Type. Photo does appear to be slightly blurrier so is this the point you're trying to make? When I was screenprinting at college using PS, we just used to convert to greyscale and then convert to bitmap w/ halftone round and print. In Affinity, I'd just apply a Halftone filter to my image and print that, so I can't understand all the need for the fill layer, threshold (as this blows out detail for me) and the group. We then just used a RIP to make a profile for Illustrator which was even better as it retained the sharp text. I'm just trying to understand all this so I can go and ask the right questions! No problem @Chris B, I appreciate you throwing your hat in the ring! Ok so first, the reason why I group is; to achieve halftones I need to have a white background layer (usually a white fill layer) which allows me to halftone the black/greyscale objects that I have as the artwork. Without the white background for the halftone filter to use, you will receive no halftones from the filter. You cannot create successful halftones for screen printing without this method because you'll land with results like your second example, on the right side version. This would not work because a "gradient transparency-ed" edge cannot be printed onto screens. We need solid black dots with no gradient fading as I'm sure your aware of. 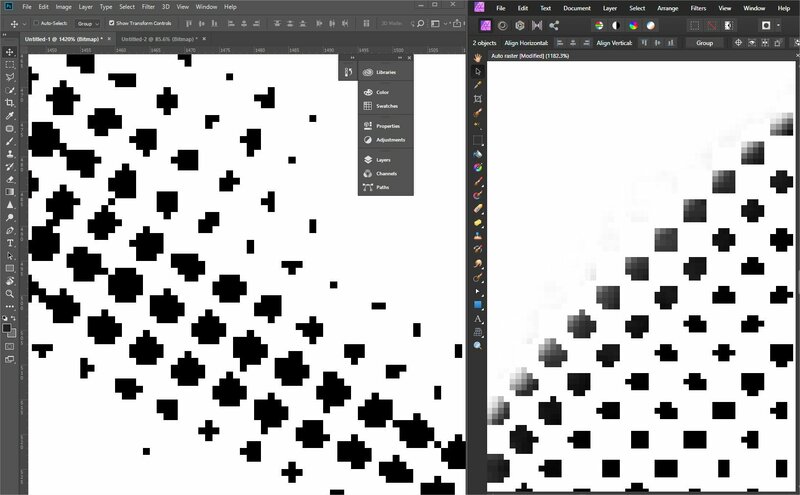 In my example you'll notice that I have a live vector object that is using my work around to allow for the halftone filter to work, but I get a "fuzzy/blurred" halftoned edge to the vector shape that has none. This is the issue I'm trying to point out and happens to text objects as well. Photoshop has next-to-none of this when going through the steps you mentioned above. I'd like for Affinity to fix what is possible in this area as what is so seemingly such a small issue but is actually a very big one for the screen printing industry. Halftones and their angle and size are absolutely critical to successful prints. Again, all of us in the industry would love an option to get away from Adobe were we can. Lastly, will we see the ability to get .25, .5, .75 increments for our angles? The industry standard is 22.5, 67.5, this would a very welcomed addition to the filter. Right, I see what you mean. I think I need to pull this apart and get something over to dev, then. I'm pretty sure we allow floating points. The app rounds up in the dialog when you type it in, however you should see a visual difference. If you take a screenshot after typing in 22.5 and then take a screenshot after typing in 23, you should see what I mean. This is something we should probably also look at.